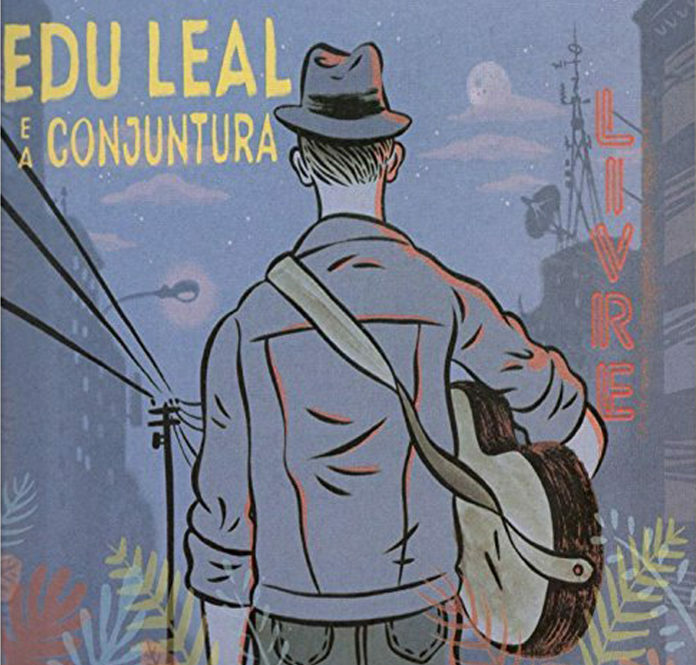 The structural plan of this recording entitled Livre by Edu Leal and the group of musicians who accompany him on this quest is about experiencing life in the raw, in urban Brasil, and living with all of the hopes, torments and joys arising out of post-dictatorship, post-the-series-of-democratically-elected (corruptly, he would convincingly argue) society. It is hardly the life of a Brasil as we see (or even know) it from the outside. But it is real and it is the Brasil that he – Mr Leal – is living through. His expression of frustration, of hope and joy (and always love) is dense and sometimes echoes the colours and textures of the music of Guinga. It is often symphonic and uses abrupt changes in rhythm, layers of harmony and atonality and dissonance, and it is always melodic and accessible. However, Mr Leal, a paulista is very much his own man and his music “sings” in a lilting voice all of his own. His music is also one that mirrors the rhythms of daily life with its myriad of vicissitudes in both the halting fragmentary note patterns of his unaccompanied solo guitar and in the chamber-like cadenzas with other instruments into which the human voice is introduced as the characters in his songs begin to come to life. Mr Leal uses various motifs and musical devices with precision and clarity, and depending on the emotion that is being depicted; atonality and dissonance, for instance, in the wry and sardonic dynamics of “Livre” and lyrical transpositions that seem to come from out of nowhere in “Do Devaneio Ao Sonho”. Interminably slow movements in song’s progresses might also explain the sarcastic veneer of “Lar, Impossível Lar?” in which bite and astringency offsets mildness and sweetness. And there is also a darkening and intensifying that comes from the strings that no amount of brightness from the others instruments or voice can disguise “Ganhando Dinheiro” (and elsewhere). In all of the perceived denseness of some of the music there is also a simplicity and immediacy to the musical language employed by Mr Leal. This is not that far removed from the world that also includes (as mentioned earlier) the deeply emotional music of Guinga. This is often a veiled sound that could work wonderfully with a larger ensemble because so many textures – real and imagined – are perceptible in much of this music, particularly when projected by the large and seemingly well-rehearsed ensemble on this disc.